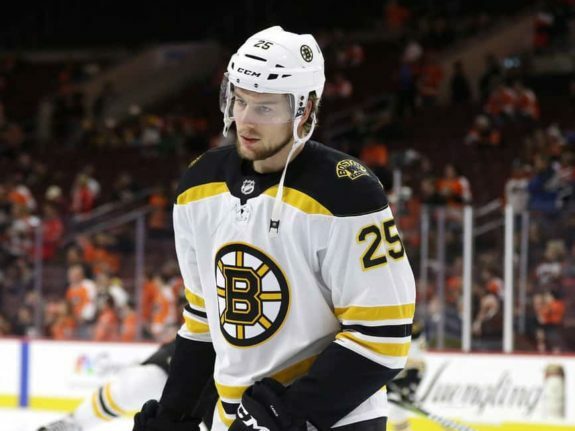 Which Boston Bruins Defenseman Should Replace Brandon Carlo? 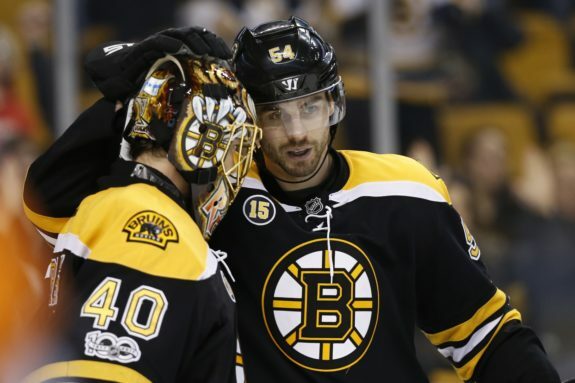 Who Replaces Carlo in a Healthy Bruins Lineup? One lucky American cashed-in on $533 million lottery ticket this past week. It was not Brandon Carlo. For the second time in his brief, two-year career, it appears that Carlo’s season has come to an abrupt and untimely end, mere feet from the homestretch. The exact severity of the injury is still unknown, but the initial report, gruesome video and pronounced swelling on the knee itself don’t paint a promising picture. It’s a sad development for the 21-year-old rearguard, having just recently and confidently “righted-the-ship” over the previous handful of games. He rose to the challenge of increased ice time and the assignments that come along with them in the absence of the team’s top pairing, looking much more confident and assertive in his six-foot-five frame, only to see his season come to a halt because of a scene straight out of a Charlie Brown cartoon. We know this for certain: Brandon Carlo will be out of the lineup for quite a while. Though the Colorado Springs-native certainly had his ups and downs on the campaign, he was a lineup-mainstay, having dressed for more games (76 of 78) than any other Bruins defenseman. He will need to be replaced. But who should get the first shot to replace him, Adam McQuaid or Nick Holden? 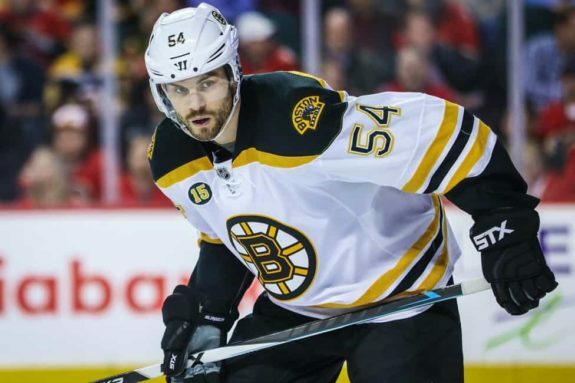 Even Adam McQuaid’s most staunch critics would admit they have a soft spot for the 31-year-old veteran and local sheriff. He’s old-school tough, both in terms of handing out fists and justice as well as eating rubber for the good of his team. He’s one of the unsung heroes in that locker room. Doesn’t get a lot of credit for what he does, the tough parts of the game, blocking shots, sticking up for your teammates. He actually manages the puck very well. He’s not a flashy player. He makes good decisions with it, and every team needs Adam McQuaid’s, and we’re certainly fortunate to have him. He’s the kind of heart and soul player who seldom basks in the spotlight but is an absolute must-have for any team with Cup aspirations. As one of the six remaining members of the 2011 team, McQuaid has played more playoff games (56) than Torey Krug, Kevan Miller, Charlie McAvoy and Matt Grzelcyk combined. And the Stanley Cup playoffs are certainly a good time to lean upon experience, following the path blazed by those who’ve been to battle and emerged victorious. But he also comes with his limitations. Though he may be “responsible” with the puck, as head coach Bruce Cassidy mentioned, he isn’t particularly deft with it. A supermassive component to the Bruins’ turnaround under Cassidy has been their transition game. The speed and ferocity with which they move the puck through the neutral zone and into the attacking zone has been one of their most dangerous weapons and it requires defensemen capable of quickly shifting from defense to offense. That is not Adam McQuaid’s game, as evidenced by his three points across 34 games on the second-highest scoring team in the NHL. Despite possessing an imposing frame similar to McQuaid’s, the six-foot-four, 215 pound Nick Holden’s game differs greatly. Last season, the deadline acquisition registered a more than respectable 34 points for the New York Rangers, good for third on the team amongst defenseman. He snaps off crisp, accurate outlet passes, capable of hitting any of of Boston’s young speed demons in-stride. When the passing lanes are congested, Holden is a swift and smooth enough skater to push the pace with his own wheels, moving pucks out of danger and into the attacking zone. But Holden too can be a fish out of water from time to time. He’s not a liability on the back end by any means; Bill Mikkelson he is not. However, he doesn’t quite possess McQuaid’s physicality, shot-blocking acumen or general shutdown ability in the defensive zone. He’s physically imposing, but isn’t nearly as adept at clearing the crease and preventing second and third-chance opportunities as his truculent counterpart. And the offense that was so present at the beginning of his Bruins tenure (four points in four games) has dried up considerably, with Holden managing just one point over his last 12 games. If a mad hockey scientist could splice Adam McQuaid and Nick Holden together, the end product would be a Hell of a defenseman. But with Dr. Victor Frankenstein no longer serving as team physician, Bruce Cassidy will have to choose between the two. To find the most suitable replacement for Brandon Carlo, one must acknowledge specifically what needs replacing. To date, only Zdeno Chara has logged more shorthanded ice time per contest than Carlo’s 2:47. Though criticism of his game has often been warranted (and easy to find ’round these parts), he’s logging the second-most minutes on the league’s fifth-ranked penalty kill unit; an oft-overlooked and underappreciated aspect of Carlo’s game. 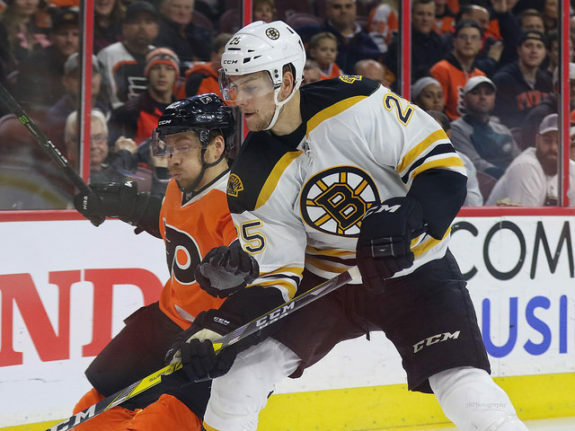 Adjusting to playing with the fleet-of-foot and five-foot-nine Torey Krug after spending the first 82 games of one’s career alongside the towering, lumbering Zdeno Chara is about as drastic a shift as possible. 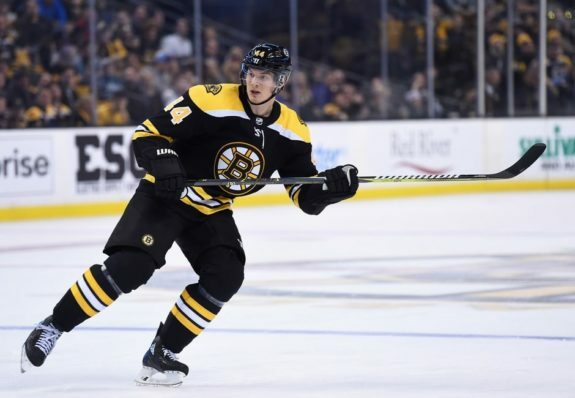 With Krug being given the green light to attack and create and play to his strengths, Carlo spent a significant portion of the season struggling to adjust to being the security blanket, as opposed to playing alongside one himself. But Torey Krug is enjoying the best season of his career, the Bruins are in first place and Carlo has blocked more shots than anyone not named “Zdeno” or “Kevan.” It’s not as though the Bruins are where they are completely in spite of Brandon Carlo. With Chara and Charlie McAvoy spending the entire season excelling together while Kevan Miller and Matt Grzelcyk did much the same for 50-plus games, it’s likely that Cassidy refrains from tinkering too much with his pairings to start the playoffs. Carlo’s replacement in the starting lineup will not only need to fill the void left behind on the penalty kill, but also alongside Krug at five-on-five, hopefully enabling the pint-sized dynamo to continue wreaking havoc from the back end. Were Charlie McAvoy, Torey Krug or Matt Grzelcyk staring down the prospect of missing the entire postseason instead of Brandon Carlo, Nick Holden would be the correct choice to step into the lineup. His skill set as a puck-mover and capable second-unit power play quarterback would be a better fit to replace the abilities which had landed on Injured Reserve. As it were, the Boston Bruins lost a defensively-minded rearguard on the eve of the playoffs, making Adam McQuaid the best fit to replace him. The NHL playoffs are a bruising, arduous marathon of attrition. Seven defensemen (at minimum) will be called upon by any team who makes a deep run, meaning both McQuaid and Holden (and now, possibly Paul Postma) will get ample playing time this Spring. But as a shot-blocking, stay-at-home, heart-and-soul veteran who excels on the penalty kill, has his name on the Stanley Cup and spent all of last season playing alongside the guy who needs a new partner, McQuaid is the obvious choice to at least get the first shot at replacing Brandon Carlo in the starting lineup. Now start the damn playoffs already.